This week the bird hot-lines were hotter than usual all over the country. A South Dakota birder working on the South Dakota Breeding Bird Atlas Survey was parked by a stream running through Spearfish Canyon in South Dakota. As he worked on his survey he heard a bird song that he knew was different from the South Dakota birds whose songs he readily recognized. He began a search for the reclusive singer, got good views and adequate photos, and ultimately determined that it was an Orange-billed Nightingale Thrush. 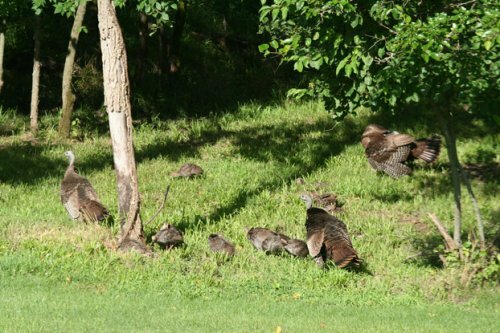 He published his finding on the internet, and the Black Hills Bird Rush began. Without the photos, I don’t suppose the birding powers that be would have believed him, notwithstanding his solid birding reputation. This Thrush is a South and Central American bird which has, to the best of my knowledge, only been identified twice before in North America. Both of the prior sightings were several years ago, near the Rio Grande. When he posted his finding, members of the birding community “flocked” to Spearfish from all over the country to try to add this real rarity to their North American Life Lists. When I arrived in mid-afternoon at the well described site, there was no one else there so I sat by the stream, ears tuned, to try to hear the bird. Shortly after I arrived, Jennifer Fowler pulled into the parking area. Jennifer is a local birder, a South Dakota Bird Atlassing field worker, and a science teacher. She had undertaken the role of keeping track of the bird and the visiting birders, and helping out all the birders who had and were continuing to come to find it. Her list of birders was at least 150 names long, including some of the nation’s best recognized, and she was certain that she had missed some. The list included a good representation of local birders, as well as many from far away places, such as California, Arizona and Florida. Soon after she arrived she cocked her ear toward up-stream, and summoned me to follow her, which I readily did. 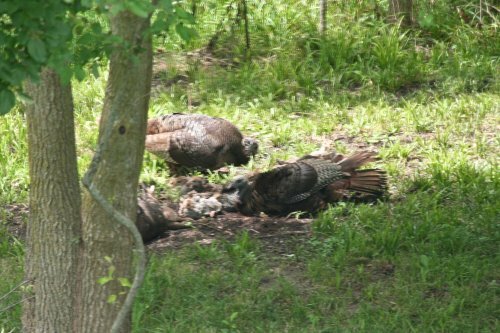 We continued to hear, but not see, the bird, as it moved about quickly in the heavy understory of leaves in the trees along the stream. Several more searchers arrived, and as the evening approached we were all thrilled to get good views of the long-singing Thrush. ( I suppose the name “Nightingale” may be a clue as to its proclivity to proclaim). Many thanks to Jennifer. The next morning I returned to the site and was rewarded with an excellent scope view of the bird as it sunned itself briefly on an open branch. I should add that I saw several Orange-billed Nightingale Thrushes in Costa Rica when I was birding there in 2002. Mission accomplished, however; it is now on my North American Life List as # 682. 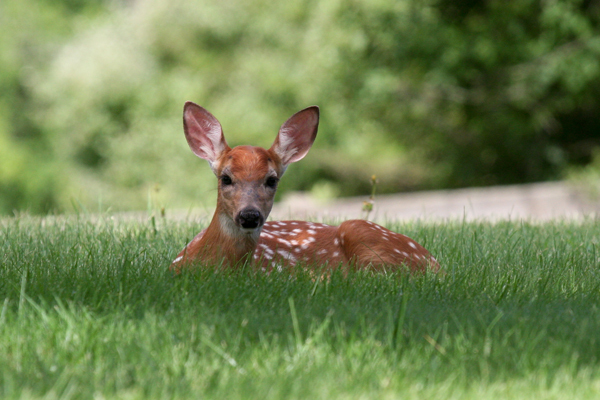 This week, on the hottest afternoon of our summer, we had 2 little fawn ornaments enjoying the shade in our front yard. When I came home about 4:00 p.m. 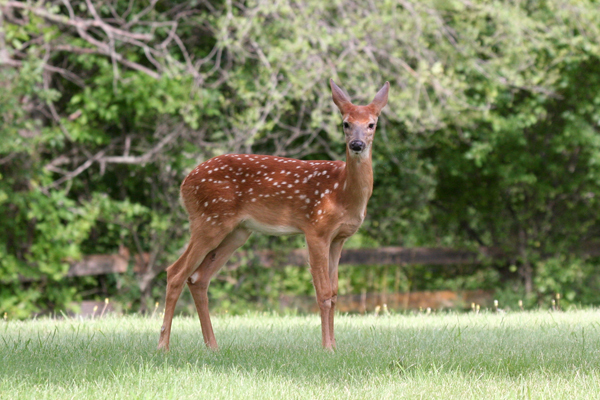 I was able, without spooking them, to drive past them and get in the house to alert my wife to their presence. The twins were not a bit camera-shy, so she was able to get some nice pictures. 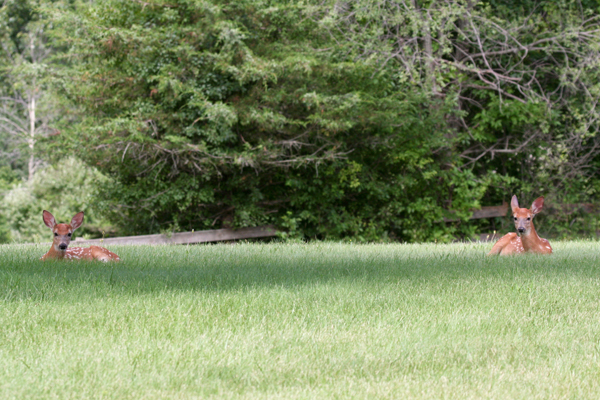 And thus we had our own private experience of the Afternoon of the Fawn(s). If you are interested in some really ethereal poetry, check out Mallarme’s poem bearing that title, (inexplicably misspelling “Fawn”, as “Faun”). Or, perhaps I misunderstood it. 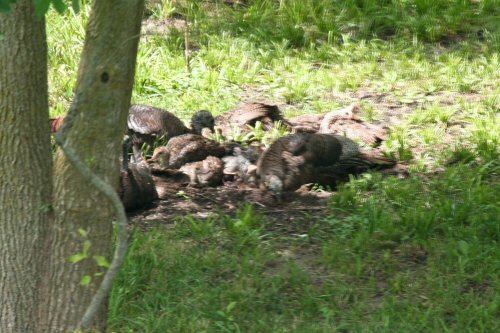 Today the 3 wild turkey hens and 11 poults returned to our yard by Brown’s Woods in West Des Moines, Iowa, and spent an hour or so dust bathing. I understand the dust bathing ritual may involve efforts to clean the grease from their feathers, eliminate small parasites and/0r cool off. 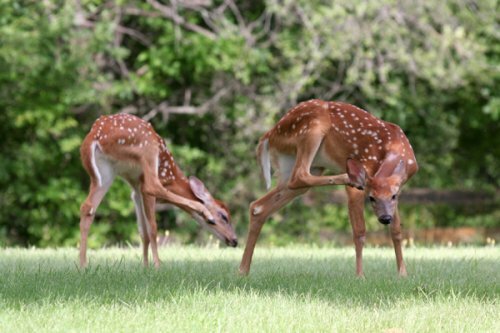 The little ones seem to learn fast. In June of this year I traveled to Nome (Alaska) to look for 5 new North American Life Birds: Arctic Loon, Gyrfalcon, Bristle-thighed Curlew, Bluethroat and White Wagtail. I hired a local tour guide (Richard Benneville) for the first day or so because I was unable to find a rental car and because he was available and knows the territory, although he is not and does not bill himself as a bird expert or guide. His forte is the history and culture of the Nome area, but he does have a good sense of where to find birds and animals. I stayed at one of the hotels and was able to rent a vehicle for 3 of the 5 days I was there. Actually, the rental cost and gas price ($4.50 per gallon) totalled more than what I paid to Richard on a daily basis, so he was a bargain. There were a lot of birders around, many with tour groups such as VENT and Fieldguides. I am told that this is the case every June. At the hotel desk was a place to write down the big discoveries of the day, and it was a helfpful resource. Nome is remotely located on the Seward Peninsula. There are 3 roads out of Nome, each ending at small villages 75 or 80 miles out. The only practical access to Nome from elsewhere in Alaska is by air, or, in summer, by sea. The ice was just breaking up when I was there. The weather was cold, windy, foggy and rainy practically all the time. Daylight prevailed about 21 hours of the day. The rain was generally light mist, so birding could be accomplished if you don’t mind being damp and cold. My long underwear got a lot of use. My first trip was out the Teller Highway. With me on this trip with Richard were the Bartells, very experienced birders. The birding was good, but I did not find any of my target birds. We saw quite a few Arctic Warblers and other warblers, including Yellow, Wilson’s and Northern Waterthrush. We had hoped to find White Wagtails in Teller, where they have been regularly reported in prior years, but diligent hunts yielded none. We enjoyed a visit with Norbert, a resident of Teller, at his home. The local residents said they had not seen any White Wagtails yet this year. The next day we took the Council Highway. I found two Arctic Loons at Safety Sound. A nest with 2 nearly fledged Gyrfalcons was easily visible on the middle pillar of the second bridge over the Soloman River. We did not spot either parent, however. This is an interesting road and we saw quite a few birds along the way. We spent some time in Council by the Niukluk River where Richard was picking up a couple from Israel who had spent the previous night at the campsite of a local outfitter. On the way back we had good looks at a Golden Eagle on her nest along side the road. The next 3 days I was on my own. I drove out the Kougarok Road, hoping to find and join up with other hikers to make the trek across the Tundra at Mile Marker 72, across from Coffee Dome. This is the historic nesting area for Bristle-thighed Curlews. The trek is teacherous for 2 reasons: one, it is Grizzly Bear country, so it is unwise to go alone; and two, the tundra over which you must walk to get to the nesting area on the ridge is very rough and difficult to traverse, especially for a 76 year-old with arthritic knees. Although I saw two hikers up on the ridge, I decided against trying to catch up with them, and, instead, drove on to the end of the Kougarok Road, or at least as far as it was open. On my last day, I once again drove to Mile Marker 72 in hopes of seeing some Curlews fly over, or of finding a group to join on the hike. After a few hours, I gave up and started to drive back to Nome when I saw an oncoming car with a family group of birders that I had seen on a couple of previous occasions. We slowed for each other and they said they were going to make the trek to try to find the Curlews. They were very gracious and welcomed me to join them. I did, and we were very successful in finding not just one, but several clearly seen and heard Bristle-thighed Curlews, quite easily distinguished by their call, color and bill shape from the otherwise similar Whimbrels which inhabit the same area. This was the highlight of my trip. Thankyou, Suyama family. I was disappointed in not finding White Wagtails or the Bluethroats, in spite of hours of effort. Others did see Bluetails, but for everyone it was an arduous search. I believe no one found any White Wagtails in the area. Some folks that I met on the trip asked me to list the birds I saw, so here they are: Red-throated Loons; Pacific Loons, Arctic Loons, Pelagic Cormorants, Tundra Swans, Brant, Mallards, American Wigeon, Pintails, Greater Scaup, Common Eiders, Long-tailed Ducks, Red-breasted Mergansers, Rough-legged Hawks, Gyrfalcons, Rock Ptarmagin, Willow Ptarmagin, Sandhill Cranes, Pacific Golden Plover, Whimbrels, Semi-palmated Sandpipers, Western Sandpipers, Red-necked Phalaropes, Parasitic Jaegers, Long-tailed Jaegers (many), Mew Gulls, Glaucous Gulls, Glaucous-winged Gulls, ARctic Terns, Ravens, Horned Lark, American Pipits, Tree Swallows, Violet-green Swallows, Cliff Swallows, Arctic Warblers, Northern Wheatear, Gray-cheeked Thrushes, Robins, Yellow Wagtails, Orange-crowned Warblers, Yellow Warblers, Northern Waterthrush, Tree Sparrows, Fox Sparrows, Savannah Sparrows, White-crowned Sparrows, Lapland Longspurs, Rusty Blackbird, Common Redpolls, Hoary Redpolls, Golden Eagle, Green-winged Teal, White-fronted Geese, Canada Geese, Bristle-thiged Curlews, Golden Crowned Sparrows, Black Scoter, Harlequin Ducks, Semi-palmated Plover, Northern Shrike and Northern Harrier. On this 6th of July, 2010 I am thankful for the gift of having been born in the USA. I owe my emigrant grandparents and first generation USA parents more than they can ever know. My thanks to them. We in America have our problems, our disagreements, our uncertain futures and, increasingly it seems, our haters, but this is still the best place in the world to live and enjoy the freedom, the economic opportunities and the educational opportunities that are not surpassed anywhere else in the world. Each generation of Americans has to make some sacrifices to preserve and earn freedom and opportunity for all of its members, and I am hopeful that the generations following this septuagenarian appreciate what they have and will make the necessary sacrifices for it. The holiday week-end was spent with family, including a shower at our home for the next grandchild, during which a few of us male members took my 5, 4 and 3 year old grandchildren to the Des Moines Zoo. The threat of rain resulted in a small crowd, but the rain held off. We all enjoyed seeing red pandas, birds, giraffes, gibbons, sea lions, seals, lions, a serval, a snow leopard, lesser kudus, and other animals. My favorite was the pair of red pandas. The grandchildren enjoyed the bird show, with Saurus Cranes, Andean Condor, Galahs, Emus, Sulphur-crested Cockatoo, and Peregrine Falcon performing wondrous feats in exchange for treats. I prefer to see birds in the wild, but the zoos of the world, at least the better ones, including Des Moines Blank Park Zoo, are performing a necessary service in displaying and often preserving our birds and other wildlife for the enjoyment of the majority of us who do not or cannot venture forth in the great outdoors to see these threatened natural wonders of the world. The evening of the 4th we all gathered again at home for a hamburger and brat cook-out, followed by the traditional homemade vanilla ice cream. It was a wonderful day and we are sorry only that all of the family, including our overseas serviceman, were unable to participate. Last week-end I went to Los Angeles to meet Steve Sosensky, a local bird guide, who had told me that he probably could help me find Lawrence’s Goldfinches. I have been birding in California on several occasions and have seen most of the California terrestrial birds, but have never succeeded in finding Lawrence’s Goldfinches. On Sunday, June 27 Steve took me to Big Tujunga Canyon where a large burn occurred last year. We quickly found 10-12 Lawrence’s Goldfinches flying back and forth across the road, and flitting about in a thin stand of tall, thin evergreens and mixed deciduous trees. I was very happy to find them, and especially to get such close and numerous views. Thanks, Steve, for a pleasant day and helping me find North American Life Bird # 681.